In the past, companies would create Facebook groups to interact with their customers. This isn’t as effective any longer, however. Today, setting up a simple fan page is much more effective at reaching your target audience. This is because too many people used Facebook groups to bombard members with spam. Depending on the nature of your business, you may even find your target audience isn’t really active on the Facebook at all, wasting your efforts. LinkedIn is often a more effective way to reach your target audience. However, this again depends on your field. The people who are on LinkedIn are more likely to be professionals. If you are targeting a specific group of professionals, this is the place to look. Search for groups that relate to your business and webinar. When you join them, you will be able to communicate with all the members, even if you aren’t connected to them. You can even set up an event and invite the whole group. If you use Twitter for your business, you can make use of it to help promote your webinar. Create a list on Twitter that will provide the names of everyone who has already registered for your webinar. You can showcase this list on your website or blog to attract even more attendees. If people see others are attending, especially if they know one or more of the people, they are more likely to attend as well. Make sure you keep the list updated as more people register. Most companies today have their own blog to share information with their customers and the rest of the world. 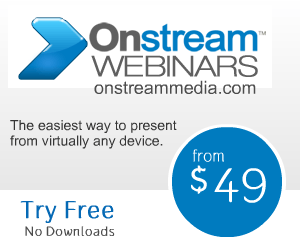 Make sure you use your blog to promote your webinar. Write a post about your webinar. You can also include a video introduction or a Q&A session that will answer everyone’s questions about attending. This can be a great way to provide additional information that can tip the scales in your favor. Not all social media will be effective in all situations. This is why it is so important to evaluate your audience and only choose to use the ones your audience uses. When you use one or more of these social media sites in conjunction with your blog, you will see greater success for your webinar. 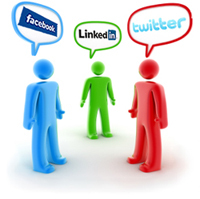 The use of social media alongside Onstream Media's communication solutions can be greatly benefitial for your business.